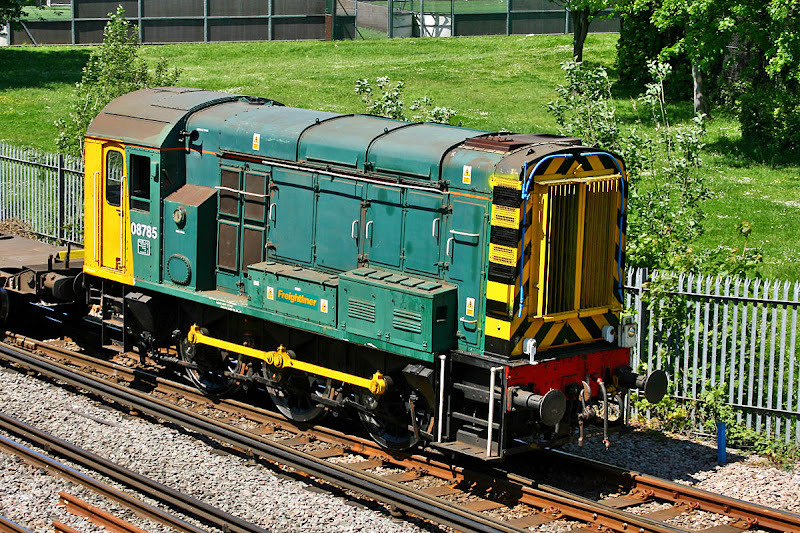 08785 is understood to be the only Freightliner Class 08 which has not previously worked in Southampton, being delivered on 15th May from LH Group at Barton under Needwood. Seen here on a Maritime - Millbrook transfer of flats on 26th May. This locomotive was new as D3953 in April 1960 from Derby Works, initially allocated to 81A (Old Oak Common) and moved to 81D (Reading) by the mid 60's. By the mid 70's it was working from OC (Old Oak Common) again and by the mid 80's was at CF (Cardiff), fitted with a buckeye coupling. More recent history at Shunterspot (requires registration). In related news, 08745 has recently been removed from Maritime after more than a decade of storage, and is now at Booth, Rotherham for scrap.